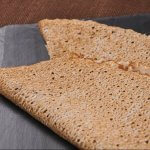 It is defined as the uses made of a mixture of wheat flour for baking, drinking water, cooking salt, yeast or leaven. It may contain a very small amount of bean flour, soybean and wheat malt and a limited number of additives defined by the regulations. 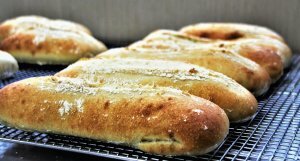 A standard Baguette has a width of about 2 inches, high of about 1.5 inches and a length of about 25 inches. It weighs about 8 ounces. The crust is very crisp and golden, while inside, the crumb is white and fluffy. In principle, it regains its shape if you press on it, this is a test of whether the bread is quality. It is made from a mixture of wheat flour, drinking water, cooking salt, yeast or leaven and possibly contains a very small amount of bean flour, soy, wheat malt, fungal amylases and gluten. French regulations ( Decree No. 93-1074 of 13 September 1993.) 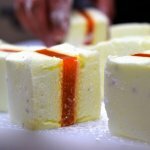 require that the products of the French tradition are obtained without the use of additives (at the quality level of the dough). Surgery is forbidden. The name for these loaves is given in France in the second half of the twentieth century. Is described in uses as consisting of wheat flour and / or rye. The manufacturing process (kneading, fermentation and cooking) must avoid bleaching the dough, develop an acidulous flavor and prolong the freshness of the bread. Bread prepared from a so-called “complete” or “integral” wheat flour. 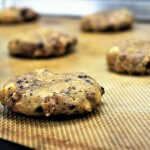 Is contains 2/3 of rye flour (at least 65%) and wheat flour 1/3. Used alone, rye flour bread-making is difficult, which is why it is always associated with wheat flour which allows lifted up / honeycomb bread. 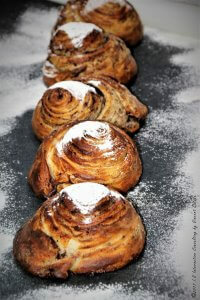 Be careful Pain au Seigle Rye (Bread with Rye) bread it contains at least 10% of rye flour and not 65%. Is contain additional ingredients (sugar, milk, butter, spelled flour …): Viennese bread, bread, bread toast … the cereal breads are part of special breads and up wheat flour to which is added cereals (corn, millet, oats, ….) and or seeds & dry fruits (cranberry, raisin, flax, poppy, sunflower …). Is a type of sweet or non-sweet bread that is characterized by its absence of crusty crust and the softness of its crumb, which appears very white. It also contains ingredients from the baguette and some butter, milk, sugar (or no). 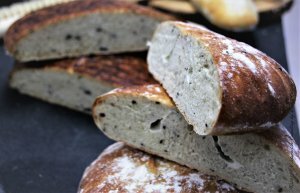 Is a white bread originating in Italy, one of the main particularity of which is a high hydration rate and the presence of olive oil among the ingredients that compose it. This type of bread is often used as a sandwich bread. The words “Organic” or “organic” may only be used by bakers who have been certified by a certifying body. The use of “Bio” flour alone does not allow to communicate on “Bio”. In France, it exists different types of French Breads. Breads are made from a flour mixture (wheat or other cereals), water and salt, fermented choice using baker’s yeast or leaven. 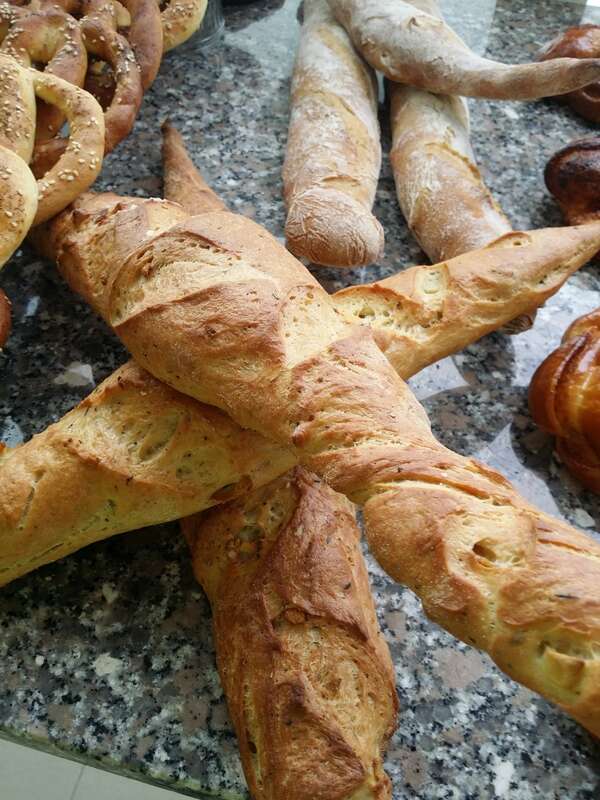 There is a wide variety of breads that differ in their manufacturing recipes but also their shapes (rod, ball, spike, focaccia …) Worldwide, the Baguette is one of the typical symbols of France and especially Paris. Along with the wine , the beret or cheese , she became a symbol even though there are other varieties of bread. 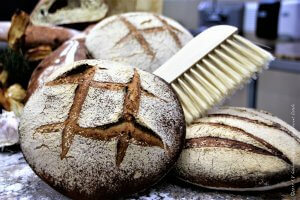 It is defined as the uses made of a mixture of wheat flour for baking, drinking water, cooking salt, yeast or leaven. It may contain a very small amount of bean flour, soybean and wheat malt and a limited number of additives defined by the regulations. 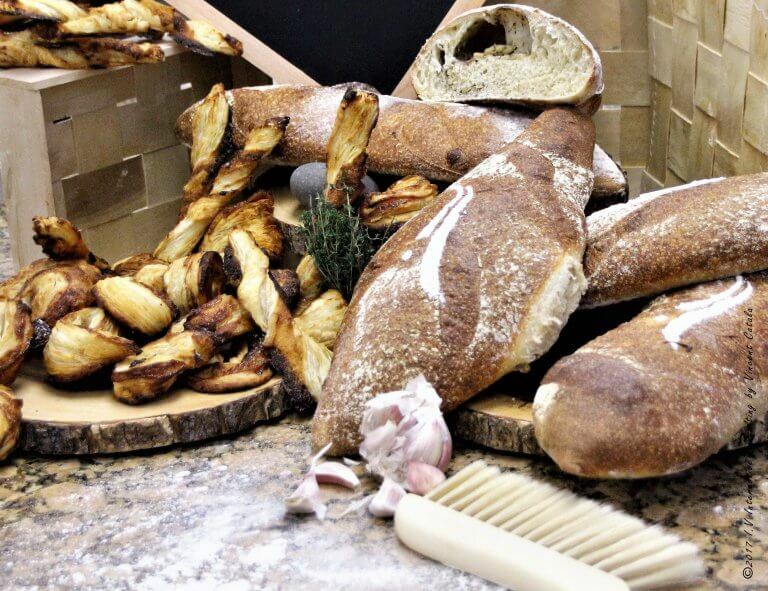 The Baguette’s weight and dough’s shape differentiates the Baguette of the other bread. A standard Baguette has a width of about 2 inches, high of about 1.5 inches and a length of about 25 inches. It weighs about 8 ounces. The crust is very crisp and golden, while inside, the crumb is white and fluffy. In principle, it regains its shape if you press on it, this is a test of whether the bread is quality. It is made from a mixture of wheat flour, drinking water, cooking salt, yeast or leaven and possibly contains a very small amount of bean flour, soy, wheat malt, fungal amylases and gluten. French regulations ( Decree No. 93-1074 of 13 September 1993.) 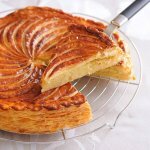 require that the products of the French tradition are obtained without the use of additives (at the quality level of the dough). Surgery is forbidden. 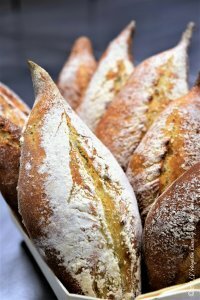 The name for these loaves is given in France in the second half of the twentieth century. Is described in uses as consisting of wheat flour and / or rye. The manufacturing process (kneading, fermentation and cooking) must avoid bleaching the dough, develop an acidulous flavor and prolong the freshness of the bread. Is contains 2/3 of rye flour (at least 65%) and wheat flour 1/3. Used alone, rye flour bread-making is difficult, which is why it is always associated with wheat flour which allows lifted up / honeycomb bread. 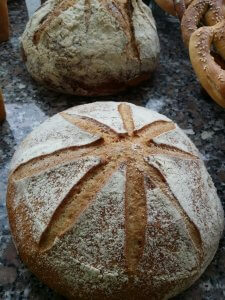 Be careful Pain au Seigle Rye (Bread with Rye) bread it contains at least 10% of rye flour and not 65%.